Millwood lake is a shallow, weedy, tree-filled body of water. Break-offs, stumps and underwater debris create plenty of cover for fish, but also demand cautious navigation. Largemouth bass, white and black crappie are abundant. In Spring, largemouth bass will be spawning among moss beds, stumps and brush in 2 to 4 feet of water. A plastic lizard fished weightless or Carolina style with a small sinker can produce some lunker bass. Jig ‘n pigs can also be deadly, black and blue seems to be the colour of choice on Millwood lake. Spinner baits fished deeper in 7-8 feet of water, especially in late spring around stumps and in river channels are very productive for post-spawn bass. Top-water baits, such as weedless spoons and zoom frogs fished in the lily pad bays are also excellent spring time tactics, especially in the early morning. Summer bass fishing is best at dawn and dusk. Buzzbaits, jitter bugs and zara spooks worked slowly on the surface can produce some explosive strikes. During full light conditions, Millwood Lake, largemouth bass with sit tight to cover under lily pads and stumps. Slowly, fishing texas worms in blue/black can produce some bass. In fall, the west ends of the pipeline and highline boat lanes are excellent bass holding areas. Spinnerbaits, crankbaits, plastics and top-waters are all good lure choices for this time of year. Working the edges of the boat lanes with Carolina rigged plastic worms can be very effective. 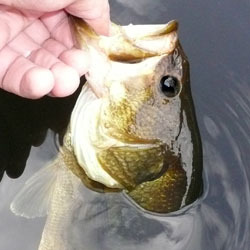 Vegetation, such as hydrilla, duckweed and lily pads, which are high at this time of year can hold good numbers of bass. At times, weedless lures worked over the top of the weeds can be good, although generally bass will sit under the weed mats, and punching weedless plastic baits down under the cover can be a deadly technique on Millwood Lake. On clear days, use lighter colors and switch to darker shades when cloudy. In winter, fish the edges of the river channel, concentrating on sharp bends and areas with submerged timber. Worms, deep-diving crankbaits, Rat-L-Traps and Shad Raps all in bright colors such as chartreuse and fire tiger are excellent choices. If the water is exceptionally murky, try orange or apple green. Kentucky bass are caught mostly by anglers working largemouth, but if you want to concentrate on Millwood Lake Kentucky bass, fish deeper and use slightly smaller lures in the area up river from White Cliffs. Crappie are abundant in Millwood Lake. Fishing for Millwood Lake crappie can be excellent at certain times of the year, especially in spring when the fish are spawning. 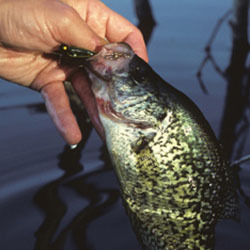 The cypress trees around Mud and Horseshoe lakes are two top crappie spawning locations. Small tube jigs are the favored presentation. After spawning, crappie disperse throughout the lake, fishing grassy areas that are closely associated with submerged timber can produce some nice crappie. As soon as the annual grasses begin to die, crappie leave their summer cover and head for deep water where they remain throughout fall and winter. Fishing at depths of 18 to 35 feet near the river channel can be productive. Best baits include jigs tipped with minnows. Mercurochrome pink, purple/white and chartreuse/black are three hot jig colors. Each detailed map provides depth, contours, structure, boat ramps, and updated fishing information. 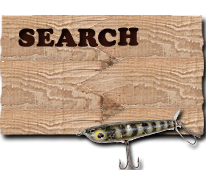 Millwood Lake fishing maps also include lake info such as gamefish abundance, forage base, water clarity, weedline depth, bottom composition, complete latitude/longitude grid lines and dozens of GPS waypoints & coordinates.